When customers interact digitally with their utilities—whether it’s on an app, on the website or via email—they want a seamless, personalized experience. At each touchpoint, they want interactions that feel like they’re tailored to them, including recommendations for products and services they actually want. They want these interactions to occur on their own terms, on their own time. HOW CAN UTILITIES MEET THESE DEMANDS? Customers are accustomed to on-demand access to information, and they expect it from today’s utilities. That means real-time reporting on energy usage, billing analysis with customized rate recommendations and easy outage reporting from any device. Franklin Energy’s NGAGE Customer Engagement is oriented around customer value—understanding how customers perceive value, and using their value motivators to develop deep relationships with them. With NGAGE Customer Engagement, utilities can easily and seamlessly provide the relevant interactions today’s customers are after, and grow participation rates, satisfaction scores and 360° engagement. HOW DOES NGAGE CUSTOMER ENGAGEMENT WORK? NGAGE Customer Engagement presents all your utility’s relevant offerings, dynamically personalized to each customer based on their unique customer journey and specific preferences. It features your utility branding and can be seamlessly integrated into your NGAGE Website, or as an account dashboard within any existing website. NGAGE Customer Engagement draws information from, and shares it back to, the entire NGAGE technology suite. As a result, your customers receive consistent, streamlined information and services. 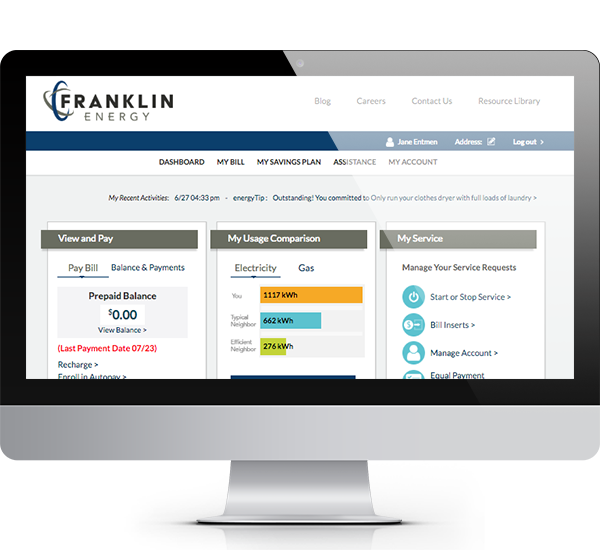 Customers can view and pay bills, sign up for electronic billing, even see a breakdown of energy use by hour. This encourages behavioral change, such as cutting back or shifting usage away from peak times. Usage comparisons to neighbors taken a step further with personalized suggestions for how to cut back, shift usage, change their rate or even switch fuel source. NGAGE Customer Engagement helps your customers define their own energy action plans, then take the right actions to achieve their goals—nudged along with gamification and rewards. Confusion about rebates is common. NGAGE Customer Engagement works with NGAGE Concierge to curate advice for customers about the best available rebates and incentives for them. Efficiency can be fun and rewarding. Customers earn badges, see their ranking amongst neighbors, and even earn reward points that can be traded for gift cards. Our friendly, in-house, BPI-trained customer care staff help your customers manage service requests, report outages and more, via phone, email or online chat. Customers are more sophisticated than ever when it comes to digital communications and their expectations for personalization. To get them fully engaged with your utility, you need to provide quick, seamless and relevant interactions at every step. Future-looking utilities are leveraging Franklin Energy's NGAGE Customer Engagement to easily engage their customers across all digital platforms, in a personalized, relevant way. Complete the form on the right to schedule a demo to see how the NGAGE Customer Engagement can help your utility easily engage today's customers, and make every interaction count.